Hi there! While I have really enjoyed making the literacy freebies, I want to show some support for my special education colleagues out there! 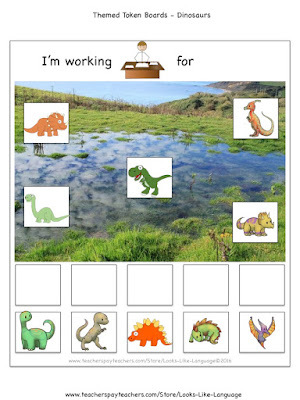 Working with students with autism can be very challenging, but using visual supports can help. Token boards are one of the classic visuals for showing students how much work is left to do. The first freebie in this set is a standard type of board, but with a dinosaur theme! I hope you find it useful! Come on over to my blog to download it. If you miss my literacy freebies, stop by my blog and let me know! I'd love to hear from you!